Thank you so much, Dear Friends for all your suggestions. You finally helped us decide on an idea that worked out well. We want to tell you all about it but, right now, we have a very important affair to attend to. This is just a quick little post to say ‘Thank You’ to you all and also ‘HAPPY Barkday’ to Mummy once again before her day ends. Well, we are watching the Oscars - the re-telecast. Not our fault that we missed the live telecast. It is the sun and the earth and the latter rotating on its axis over 24 hours that made it impossible for us here in India to get up at the hour it was on live. Anyway, we got to go now. Can't afford to miss THIS telecast too. Pee ess: Mummy says HEAPS of Thanks for all your wishes. And she says you really completed her day. Don’t let Mummy know we asked, but we DESPERATELY need your help. We have this HUGE problem. You see, tomorrow is Mummy’s Birthday and we don’t quite know how to get Mummy a cake without her knowing about it. We get Daddy to call up a baker and order one. Chances are that Mummy will answer the door. And she would calmly receive the cake. ‘So my cake is here. Let’s see what you got for me’. ‘NO Mummy. Don’t open it now’. ‘Oh Ok. There are still few more hours to go till midnight and considering the rising temperatures, I’d suggest we keep it in the fridge’. We go and get it ourselves. ‘So you guys are going out. Give me 10 minutes to get ready’. Daddy goes out alone to get the cake. Daddy gets the car out instead of his bike that he usually uses when he goes out alone. Obviously, it won’t be advisable to try balancing a cake in insanely busy traffic on a bike. ‘I don’t know what you mean. I just need to go get that book’. If you need to win that game of Poker, make sure Daddy isn’t in your team! So you see, the countdown to Mummy’s birthday has already begun and we are still cakeless. Maybe we will just surprise her this time…NO CAKE! DOG, n. A subsidiary Deity designed to catch the overflow and surplus of the world's worship.... [H]is master works for the means wherewith to purchase the idle wag of the Solomonic tail, seasoned with a look of tolerant recognition. When you leave them in the morning, they stick their nose in the door crack and stand there like a portrait until you turn the key eight hours later. The pictures are from an outing to the ruins of a fort on the outskirts of our city. Sadly, the experience wasn’t as exciting or even remotely close to how good the pictures make it look. After driving for over 50 kilometres on a dusty, dry, un-aesthetic and overcrowded highway, we reached this place much hyped about as a weekend get-away. Well, you do feel like getting away. Especially if you had harboured great expectations based on the hype on websites (what were they all thinking?!!) and are rudely greeted by a ill-maintained, ramshackle fort right in the middle of a crowded but insignificant town! The clear blue skies, the rustic old countryside and the tiny little town actually looked more picturesque in our photographs than in reality. The only saving grace was the lovely weather that day, which kind of made up for the rest of the disappointments. We tried to make the best of the trip - climbed right up to the peaks of those huge rocks, raced down the stone-staircase ruins, chased a herd of goats and munched on the delicious picnic lunched Daddy had prepared. And made some beautiful pictures. Of course, the reason you don’t see Shadow in the pictures is because we had gone on this trip long before he came to live to us. Early October last year, to be exact. We know he would love to climb those rocks, but we certainly aren’t ever going back to that disappointing place again. It isn’t worth all the time and energy you spend. We are linking to ‘SKYWATCH’. For more skies from around the world, please do click HERE. For almost two years now, there is this jeep lying abandoned beside our backyard gate. Occasionally it wheezes, coughs, sputters and emits a dark, all suffocating smoke in response to its owner’s (Our eccentric neighbour!) hopeful attempts to bring it back to life! What purpose it was meant to serve, lying dormant for the last two years, we could never fathom. Maybe everything, however irrelevant or extraneous it may appear, actually does serve a purpose in life. We just hope our eccentric and unpredictable neighbour doesn’t decide to drive them out of their home and …err…drive their home away!! 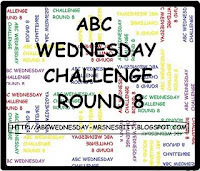 We are playing ABC WEDNESDAY with Mrs. Nesbitt and her Fabulous Team. Our offering for the week : 'F' is for Feral. All we have been doing since last night is read, read and read more about Blogger - woes!! And unless we mean to write some thesis someday on this woeful topic, we decided we might as well stop! Well, no amount of installing and uninstalling would bring back the comments tab on Ginger’s Beach post. So, we have given up. At least the tab shows up in our new posts. Thank Dog! Thanks for all your comments and suggestions. Whether they prove technically helpful or not is never the issue. It is a relief to know our problem is not an uniquely hopeless one! For some reason, our ‘Post Comment’ tab has disappeared from our earlier post!! Mummy was trying to install ‘Intense Debate Comments’ form and now neither that nor our original blogger form shows up. We are so very upset. We tried everything but the tab just won't show up. Do you know how to get past this irritating blogger tantrum? Please do leave your suggestions, if any? And if you are using 'Intense debate', please let us know what we can do if the comment form doesn't show up inspite of following ALL their instructions. Maybe we should just stick to our conventional form. Your thoughts are more important than some fancy form anyday. And together we walk through Life….. I am ten years old and in my opinion you are the best zoologist in the British Isles (except Peter Scott). This very endearing letter was meant for Gerald Durrell, the most enjoyable zoologist we have ever come across. Born in Jamshedpur in India in 1925, Durrell’s family moved back to Britain after his father’s death. Gerald Durrell was and still is one of Britain’s most popular and delightful writers, an avid zoologist and a passionate naturalist. ‘My Family and Other Animals’ is the most celebrated in the series of books this amazing man went on to write. By his own admission, he wrote in order to finance his innumerable expeditions to various parts of the world – missions to collect rare specimens for preservation in his zoo. Thank Dogness he chose to raise funds this way, for otherwise we would never have had the pleasure of knowing this wonderful pawson as we do now. His unique brand of humour, his extraordinary wit, his childlike enthusiasm and his dedication to save the unique wildlife of our planet is an inspiration that is powerful enough to motivate both the old and young alike. Mummy came across ‘My Family and Other Animals’ in a seconds-sale book store some years back. At first she wasn’t very sure. ‘An autobiography you say?’ she enquired of the man who was trying hard to push this book into Mummy’s already stuffed bag. And then Mummy read the prologue. Well, Gerald Durrell doesn’t call it that. He calls it ‘The Speech for the Defence’. The shopkeeper was afraid he did not. That didn’t deter her from researching this wonderful writer and over time we have collected many of his works. You might be wondering about the words that were responsible for our instant change of heart about autobiographies. This is the story of a five-year sojourn that I and my family made on the Greek island of Corfu. It was originally intended to be a mildly nostalgic account of the natural history of the island, but I made a grave mistake by introducing my family into the book in the first few pages. Having got themselves on paper, they then proceeded to establish themselves and invite various friends to share the chapters. It was only with the greatest difficulty, and by exercising considerable cunning, that I managed to retain a few pages here and there which I could devote exclusively to animals. Gerald Durrell dedicates this delightful book to his mother. Never have we come across a more engrossing, delightful and amusing autobiography in our entire lives. Not that we read many autobiographies, we don’t. But this particular one is just ‘un –putdownable’! It is amazing that a single man’s tale about his life with a fleet of animals and birds will prove to be so delightfully bewitching. We can go on and on about Durrell but we chose to quote his brother Larry who has, very succinctly, summarised all that anyone could say about him. Obviously, after getting engrossed in the enthralling ensemble of Gerald Durrell’s books, the only ‘E’ word that emerged is ‘ESMERALDA’. To introduce Esmeralda to you as a pig would be nothing short of sacrilege for Monsieur Clot, to whom she belonged, regarded her with a reverence accorded to a saint! Gerald Durrell’s encounter with this illustrious Esmeralda is worth a read. Had it not been for his many sojourns, this specific one in a delectable little French village of Perigord, and for his wish to explore the glorious countryside that particular autumn afternoon, we would never have known of Esmeralda! Presently, I sat down on the sturdy carcase of an elderly oak to enjoy my lunch and just as I had finished there was a rustling in the dead ginger-coloured bracken and an enormous pig appeared. She was as surprised to see me as I was to see her. We gazed at each other with interest. She had small golden eyes full of wisdom and mischief, her ears drooped down each side of her face like a nun’s habit. She had about her an aura not, as one would assume, of pig but a delicate fragrant scent that conjured up spring meadows ablaze with flowers. I had never smelt a pig like her. Durrell proceeded to lure her into his station wagon, drove down to the village inn he was staying in and found the redoubtable owner, Jean. ‘Monsieur Clot lives in “Les Arbousier ’s”, he said. ‘And where is that?’ I asked. ‘Oh, but you must know him, he’s our carpenter. He lives down in the valley by the river. ‘That way,’ he said, and pointed. Jean looked at me in astonishment. ‘It is an oak,’ he said. He thought about it carefully. Whether Durrell manages to find Monsieur Clot's farmhouse and bring back Esmeralda to him is for you to find out! We envisage that our efforts at reviewing Gerald Durrell’s books have left you duly enamoured by this enchanting man and that you are sufficiently enticed to go explore his enthralling world yourself. Well, buy, beg, borrow or steal one if you have to, but please just go read Durrell. 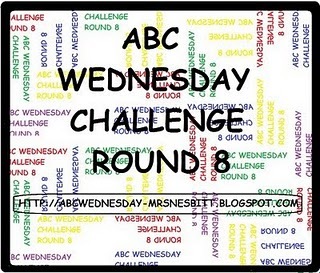 This is our entry for this week’s ABC wednesday with Denise Nesbitt and her encouraging team. Because we missed posting last week, we have encumbered you with both ‘D’ and ‘E’ this week. We are just so very thankful. We definitely have the BEST friends in all of blogdom. For that matter, the Best Friends one can ever wish for. We have been so, so behind in blog visits and commenting and stuff, of late. But in spite of that, you have all been with us and have always taken the time to come visit us. Not only do you visit us, you actually patiently trounce the all prevailing blogger owes and leave us the most wonderful, kindest and the most touching comments. Thank you so very much from the bottom of our hearts. We cherish all the friendships we have found here. Sometimes, we feel they are more real than the real ones, if you know what we mean. We want so much to be able to go visit each and every one of you. But things have been pretty crazy around here, what with our shifting plans and Mummy’s work. We tried hard to squeeze in our Valentine Day post- yes, a very special post too in honour of our little brother Shadow – and raced against time to make it on D-Day, but Time outraced us! If you noticed it, our V-Day post was on the 15th of Feb!! We were a little upset. But then we decided it was alright. After all it is not the day that matters as much as the thought behind celebrating it. V-Day is actually just a reminder for us to spread a little love, friendship and joy. So what if we do it a day later. We hope you all had a fabulous day and hugged and kissed everypuppy you love in this world. And in the process, also got some nice pressies and treats. We had a quiet day at home with Daddy while Mummy worked the ENTIRE day! It being a Monday did not help matters. Like Lola had mentioned, it is certainly not Mummy’s favourite day of the week since it is usually the busiest. But she did fix us a special dinner – Mummy special tomato-chicken and loads of bones. There wasn’t any cake though. Now, ever since Booker’s Mama told our Mummy how to make a strawberry shortcake, we have been dying to have some. Ah! For some nice, juicy cake! Sadly, it is already too hot for fresh strawberries in this part of the world. Or for Blueberries or Raspberries or any other berry for that matter. But berries or no berries, we think Mummy should at least bake us a plain old vanilla cake and top it with whipped cream. We are ready to settle for that. We will definitely let you know if our luck turns! And we hope Mummy will manage to help us visit everybody by the time this week ends. That is a good long rope, don’t you think? We LOVE YOU Heaps, Shadow Baby. We think YOU make the CUTEST Valentine in the WHOLE WIDE WORLD! HAPPY HAPPY VALENTINE’s Day, Everypuppy!